Madagascar is an island country located in the Indian Ocean. It lies about 400 km off the east coast of Southern Africa. 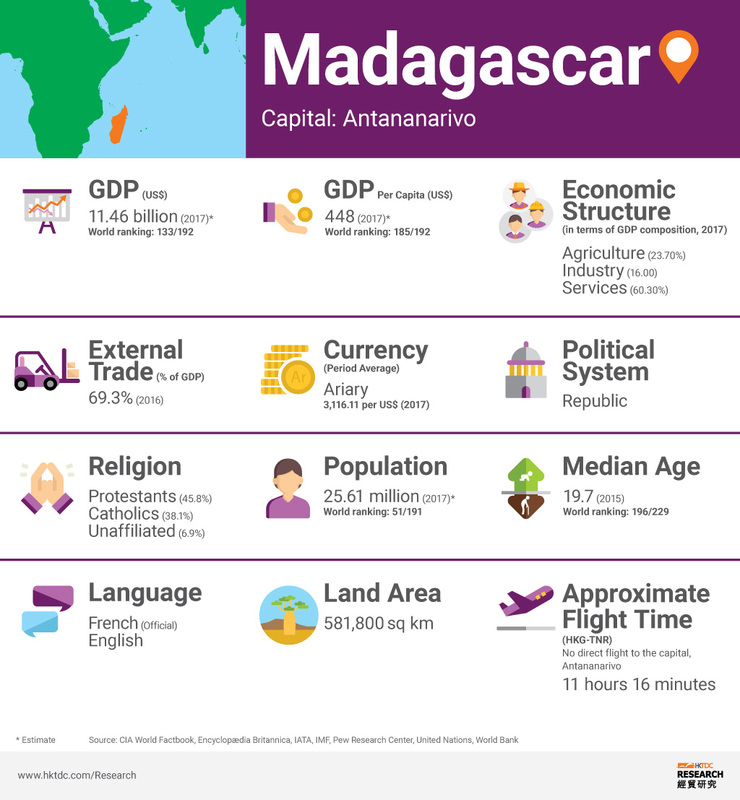 Madagascar is a low-income country, with its economy largely relying on agriculture which accounts for about 70% of employment. Yet the country is frequently hit by natural disasters including storms, floods and droughts, which disrupt agricultural production and often poses threats to food security. Madagascar’s major exports include vanilla, raw nickel and cloves, which combined to account for more than 40% of the country’s total exports. The country’s primary export markets are France, US, Germany and China. Madagascar is one of the world’s top producers of vanilla, supplying about 80% of the world’s vanilla. Amid the growing demand by large-scale food manufacturers to produce natural vanilla flavour, the price of vanilla has surged by almost four times since 2015, which has helped the country to narrow its trade deficit. Madagascar acceded to the WTO in 1995. It is also a member country of the Southern African Development Community (SADC) and Common Market for East and Southern Africa. Madagascar has concluded bilateral investment agreements with seven countries including China, France, Germany and Switzerland. Since its independence from France in 1960, Madagascar has experienced periods of political instability. The political crisis in 2009 led to international economic sanctions including those imposed by the EU and the US. In response to the democratic elections held in 2014, the US reinstated Madagascar’s eligibility to the African Growth and Opportunity Act (AGOA) which expanded the product scope for duty-free exports to the US based on the existing Generalised System of Preferences (GSP). With an aim to boost foreign direct investment and strengthen the competitiveness of the private sector, the government established the Economic Development Board of Madagascar (EDBM) in 2006. As the official agency for investment promotion, EDBM facilitates the approval of investment projects, through providing one-stop shop and tailored services for investors in setting up and expanding their businesses in Madagascar. Madagascar’s Investment Law stipulates that investors, both foreign and local, are allowed to hold up to 100% share of capital in the company, except for certain sectors which are specifically regulated, including banking, insurance, mining, petroleum, telecommunications, medical, paramedical and pharmaceutical activities. Cumulative FDI in Madagascar reached US$5.88 billion in 2016, compared to US$4.92 billion in 2011. In the 2018 Doing Business report published by the World Bank, Madagascar ranked 162 out of 190 economies. In March 2017, China and Madagascar signed a memorandum of understanding (MOU) on jointly advancing the Belt and Road Initiative, as well as bilateral agreements in economic co-operation, trade and infrastructure construction. Total trade between Madagascar and China increased by 8.6% to US$1.25 billion in 2017. According to China’s Ministry of Commerce, China’s cumulative FDI in Madagascar was US$297.6 million in 2016, compared to US$25.4 million in 2011.